Adrien Broner said as obvious as everyone wants cheese on a burger, he beat WBA welterweight champion Sen. Manny Pacquiao in their 12-round bout at the MGM Grand Garden Arena in Las Vegas last Saturday night and blamed a conspiracy to bring him down so there wouldn’t be a bump in staging a rematch between the Filipino icon and Floyd Mayweather, Jr. But Broner should be told that not everyone wants cheese on a burger and if he has a bone to pick with the judges who scored it for Pacquiao, who cares? Maybe, only his seven children with three different women and the rest of his family agree with him that he deserved to win. The stats sheet showed that in the 12th and last round, Broner connected only one of 22 punches thrown for a five percent landing rate as he danced away from Pacquiao to survive. It was the round where he was least busy with his hands because he was on the run. In the first round, he went two of 22. His best round was the fourth where he fired eight of 31 but judge Tim Cheatham still gave it to Pacquiao. The only round that the three judges concurred in scoring for Broner was the 10th where he was seven of 27 compared to Pacquiao’s six of 35. Overall, Pacquiao landed 112 of 568 punches to Broner’s 50 of 295. Broner out-hit Pacquiao in only the fourth and 10th rounds. In power shots, Pacquiao was 82 of 197 to Broner’s 39 of 160. The fight was so lopsided that the Las Vegas Review Journal called it a rout and said Pacquiao dominated to retain the crown. The newspaper scored it 119-109, giving Broner only one round. It was the same score turned in by the English newspaper The Guardian. “Pacquiao landed big shots to stagger Broner, who never has been knocked out in his professional career, but couldn’t seal the deal despite his best efforts with sustained flurries against the ropes in the seventh and ninth rounds as Broner covered up and survived,” wrote Adam Hill in the Las Vegas Review Journal. Pacquiao later mentioned lead trainer Buboy Fernandez reined him in to avoid getting careless like what happened in the fourth encounter with Juan Manuel Marquez. He said he wanted to go for a knockout and could’ve put Broner to sleep but held back because Fernandez advised to proceed with caution. In the ninth, a sweeping left hook from Pacquiao sent Broner reeling backwards, his glove touching the top strand while trying to stay on his feet. If the ropes had held up Broner to break a fall, referee Russell Mora would’ve called a knockdown. It was Pacquiao’s best punch of the fight. In the seventh, a body shot contorted Broner’s face and another blow to the middle made him wince in pain. An official count from the MGM Grand Garden Arena set the attendance at 13,025 which was described as a sellout. In its website, MGM said the capacity is 17,157. Another source set the capacity at 16,800. Perhaps, MGM reconfigured the seating arrangement for boxing to maximize the limit to only 13,025. The day before the fight, Pacquiao’s staff desperately looked for 1,000 more tickets to distribute to unexpected guests and couldn’t source from the box office. The attendance was a clear indication that Pacquiao’s popularity hasn’t waned. It was his first fight in Las Vegas since he decisioned Jessie Vargas in November 2016 and the first fight at the MGM Grand Garden Arena since he outpointed Tim Bradley in April 2016. The Broner bout was Pacquiao’s 14th at the venue dating back to 2001 when he halted Lehlo Ledwaba for the IBF superbantamweight title. His record at the MGM Grand Garden Arena is now 9-4-1. Broner’s rants are disturbing. He doesn’t seem to be mentally stable. Go over his history and you’ll find that he has been charged with domestic violence, beating up women, stealing from someone to whom he lost a bet of $14,000, witness intimidation, showing up for a court hearing drunk and late, robbery, illegal possession of a lethal weapon and more. The indications are he’s got loose marbles. Broner’s nickname is The Problem. More than being a problem to others, his problem is himself. He needs psychiatric treatment and probably belongs in a mental asylum. Broner is a danger to society because he’s delusional. He doesn’t see reality for what it is and imagines reality to be what he conjures in his mind. Broner isn’t a sore loser. He’s a mentally-challenged, foul-mouthed braggart who lives in a self-created fantasy world. In the end, you feel sorry for him. 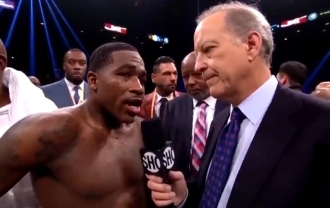 Photo: Adrien Broner rants during an interview with Showtime's Jim Gray after his defeat to Manny Pacquiao Saturday night, Jan. 19, 2019 at MGM Grand Garden Arena in Las Vegas.